Scottish wonderkids Bubblegum Lemonade debuted early this year with an outstanding single ‘Ten Years Younger’ that earned song of the day honors on influential radio station KEXP and amassed countless positive reviews in the music press including favorable comparisons to influential 60’s popstars (The Velvet Underground, The Monkees, The Byrds) and 80’s indie legends (Jesus and Mary Chain, Razorcuts, Biff Bang Pow!). Before delivering the all important debut album, the band pause for a moment to release a spectacular second EP! Title track 'Susan's In The Sky' is an everyday tale of an air hostess and her slacker boyfriend caught up in a Romeo and Juliet type scenario. It's another sunshine wall of pop with Rickenbacker guitars, tambourines and nice organ bits. A short dose of California sunshine perfect for all seasons. Among the EP’s exclusive extra tracks, the cleverly titled ‘Surfin’ USB’ is a proper jangle with fuzzy guitars and a nice Beach Boys coda, while ‘Just Like You’ continues the California theme in a 150 bpm mini classic drenched in Mary Chain feedback with a mix of fuzz and surf guitars. Closing track ‘Holocaust’ is a superb cover of the legendary Big Star classic featuring a mix of Rickenbacker and acoustic guitars. Once described as “the perfect C86 pop band that just happened to turn up 22 years behind schedule,” Bubblegum Lemonade deliver instantly memorable songs with brilliant pop melodies. ‘Susan’s In The Sky’ is another remarkable success for Matinée and a vibrant reminder of the essential new pop coming out of Scotland. Limited to 1000 copies in custom minijacket sleeve. Bubblegum Lemonade have chosen (or saddled themselves with) a name that may well have got them lynched in the 80s. It’s not the greatest name ever (unless it’s a tribute to Baby Lemonade and Bubblegum Splash) and seems a little twee. Musically, they are more robust than their moniker would suggest. 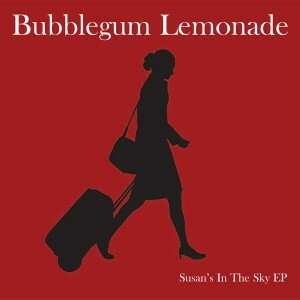 ‘Susan’s In The Sky’ is a neat slab of catchy 60s inflected guitar pop, mixing a surf feel with the girl group sound and augmented by a fuzzy warm bass, with dumb teenage lyrics such as ‘In the summer we’ll take the long road in your father’s car / In the summer in your father’s car we’ll sleep beneath the stars’. ‘Surfin’ USB’ is a cool revamp of the Marychain’s early surf fixation (‘Kill Surf City’ and their cover of ‘Surfin’ USA), giving the form a West Coast (of Scotland) twist: “Monday morning raining down/Monday’s plans are all at sea/Everyone’s surfin’ USB.” It even has some cool “Woo-ooo-eee-ooo” vocals towards the end. ‘Just Like You’ has a livelier sound with more of an edge to it’s frazzled, fuzzed-out guitars and is my favourite song on the E.P. “Holocaust’ is the latest instalment of Glasgow’s Big Star / Alex Chilton love-in. In its original form it’s one of the bleakest songs ever and Bubblegum Lemonade’s mid-tempo version captures the dark beauty at the heart of the song. With the exception of ‘Holocaust’, no song passes the three-minute mark. Almost perfect pop. However, my only criticism of this E.P. is that the production sounds rather flat and a little lifeless, as though the band were scared to let loose in the studio, that they were so focussed on getting the songs ‘perfect’ that they lost some of their energy and edge. That aside, this is still an enjoyable, fun record. --Is This Music?